I’m a very heavy Trello user and erudite GTD’er, so I was thrilled to stumble upon Josh Earl’s GTD-with-Trello system, which I’m going to experiment with. 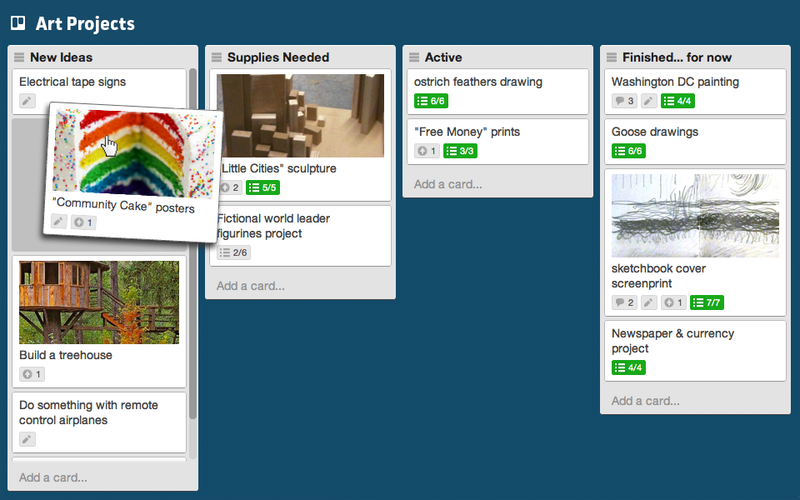 I’ve been using Ryan Carson’s (non-GTD, but effective) approach to organizing TODOs with Trello for a few months. It’s worked well, but my biggest impediment lately has been my failure to clearly define–in GTD parlance–a next physical action for every project. If I don’t have a list of next physical actions in front of me when I sit down at my desk I invariably spend 10-15 minutes (and lots of mental cycles) simply deciding what the hell I should be doing. Sometimes I pay that tax multiple times a day. If I had a list of very clearly defined, bite-sized actions, I wouldn’t have to think. I could just churn and burn. If you are sloppy, and pick big “chunky” tasks…then you haven’t really thought about what you are going to do. And when you haven’t thought about what you’re going to do, you just can’t know how long it will take. But a nice side-effect that Joel doesn’t mention is that, when you know what you’re going to do, you can stop stressing and do your job.